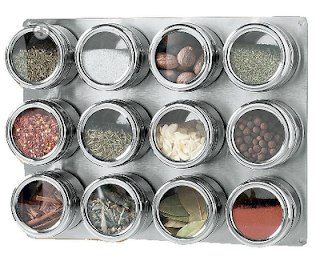 I have come across something I MUST HAVE, which is this awesome little spice rack which, for lack of a better description, is a wall-mounted-magnetic-spice-board. Since the lids are clear, the spices can be viewed very easily and I'm sure you could easily add your own labels in case some of the spices are hard to tell apart. We generally buy spices as we need them and then they sit in the cupboard. Since I am five foot nothing, I have encountered another problem where I have to jump up on the counter, kneel in front of the cupboard, then go through all the spices while I am cooking. So this actually saves valuable cupboard space and shortens my cooking time. Double score!